How was your childhood like? Were you too much into TT during your childhood? All that comes to my mind is the house I was brought up. ‘Palace’ would be the right word given the magnanimity of the house ‘Rama Mahal’ in Lloyds Road, Chennai which was Sir C.V. Raman’s. Being a good friend and client of my maternal grandfather Rama Meenakshisundaram Seshadri, he let us live there for a nominal rent. Though we had a TT table at Rama Mahal and my maternal uncles had won quite a few TT tournaments to their credit, the whole family was fascinated by Cricket, Racing and Tennis. And I accompanied them to watch Cricket test matches, Davis cup tournaments and Racing. In fact, I was introduced to cricket by uncles who had formed a league team by the name Vigneshwara XI, but after a freak accident, a broken skull bone and surgery, nobody in the family wanted me to get back to cricket. Didn’t your parents influence your liking for sports? My dad was in the Indian railway service of Electrical Engineers. Since his was a transferable job, both parents were away and hence I grew up in my grandfather’s house. He was a doting grandfather and my maternal uncles were no less. I can’t deny my parents influence whatsoever because my grandfather and uncles discussed anything about me with my parents. After I grew up, I did rely on my parents for their suggestions and advice. At what age were you enrolled for systematic TT training and where? 12. At the Emesor Sports Council. It happened when I was sulking over my loss to a 53 year old TT enthusiast at the ‘non-medallist’ TT event conducted by the Madras Port Trust. A few of my Kendriya Vidyalaya (IIT) classmates were being trained at Emesor. Thus it happened. I’m so thankful to Emesor for having shaped me up those years. Sir, you have so many ‘wins’ to your credit. Three times National Champion, Arjuna Awardee and Gold medallist in B.A Economics, Madras University. Did you always play to win? (Laughs)Looking back, I realize that I played to win. Again, I can vouch that I took some qualities after my grandfather like academic brilliance, strong will and the guts to fight no matter what strengths my opponents were blessed with. Participation is important but winning is the best not to mention my share of defeats and heartbreaks. There seems to be a tinge of your grandfather in all your thoughts. What was the best quality in him that you imbibed and that helped you carry on? I can’t stick to just one because people who know my grandfather say they see him in me. He excelled in all he did, be it his role as ‘Tinneveli’ district collector, as a lawyer and as the secretary of the South India Motion Pictures and Studio Owners’ Association (SIMPSA). Still if you insist I must mention one trait then I would say that what helped me fight ‘Big Fights’ is the never-give-up attitude handed down by my grandfather that gave me the resilience to hang on and go on. Were you trained only at Emesor? Not really. My early days at Emesor did pay off. In the international arena we see players from China, Japan, Korea and Taiwan playing superior game. I mean the techniques. After my TN junior championship, I was selected by the Table Tennis Federation of India for six weeks of training at Seoul. Another time, I had the privilege to be trained at Japan in the Sesa Kukai Club run by twice world champion Ichiro Ogimura. Only after honing my skills at Japan I was able to mark my presence here on the national scene. How different is the training there? Altogether. It was both, physical and mental too with an eye on the players’ diet. One thing complimented the other. 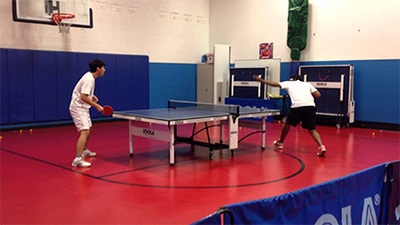 While being trained there, I perfected the continuous top spin, third ball top and swing toss. Everything was so intense but balanced. The point is anywhere I went I trained hard. How does it feel today about having represented India 25 times? Then I felt so proud and accomplished leading the Indian team to Saudi Arabia, Pakistan and Vietnam. People knew that I was a team man. When I say ‘people’, I mean my friends, rivals, teammates and commentators. Captaining India in the Asian Championship, Calcutta and the Commonwealth Championship in Bombay are still fresh in my memory. Today, I feel grateful to every single person who had a role, however big or small it was and is. And ARJUNA AWARD…..was it a dream come true? If we work hard enough, dreams do come true. Dream big but take action. It was indeed a glorious feeling after years of hard work plus hardships that I earned the privilege. Explaining that ‘Euphoria’ is difficult. Memories of the regal ambience, smiles, conversations, compliments and how I felt in that maroon blazer come alive in me and enchants me. Flashy and aggressive was your style. It paid off too. Was it physically demanding? To the spectators and commentators, flashy and aggressive is a game style. But to me, it’s just my game. However, I played to win. What were some of your best wins that still overwhelm you? Any win was my best. But few which I cherish are my winning against Kamlesh Mehta, the charismatic Vilas Menon, the National Champion Niraj Bajaj and the stalwart Jagannath. Your autobiography ‘My Fight Back from Death’s Door’ makes an impressive, inspiring read. Few chapters like ‘The surgery, The Battle for Life, Hospital Routine, Treatment-of Every Kind, My Trip Abroad’ are so harrowing to read that I don’t find enough strength to discuss it. Amidst every ordeal you looked forward to the ‘Next Best Thing’. Is it a mental strategy! Yes, may be! I was and am a fighter. To avoid sinking forever, I pulled myself up and I’m happy I still float. (Smiles) ‘When the going gets tough, the tough get going’. After years of legal battle, defendants expected a “Received with thanks”…and the last four words in the chapter ‘The Judgement’ help readers understand that there are stories untold…Is a sequel to your autobiography on the cards? Nothing as of now. As for me, writing a book, the thinking that goes into it is not just mental but physical too. All experiences after the fatal surgery had been so humbling and humiliating that the more I process it, I feel torn apart and then it takes a lot of energy, again mental and physical, to regain composure. Minus those painful memories I feel complete. Was your wife a fan of your’s! My wife Mala seemed to know me as a national player, freak operation and aftermath etc through the newspapers. It so happened that she was my friend’s colleague in The State Bank. When my friend mooted the proposal, she gave it a thought, we met and spoke and since 1998 we are happily married. Then the Lifetime Achievement Award happened in 1999…how did you cherish it as a family? It was another moment of glory that we recall and relive. Every award makes me believe that whatever I did mattered so much. For family members, awards represent hope. You believe in ‘Dreaming Big’ and having a vision for the future resonating thoughts of our former President Dr. A.P.J Abdul Kalam. Please share your thoughts. Oh, yes. If I have the permission, may I say ‘Great minds think alike’! Behind every achievement, big or small they might seem, there is a dream. Extraordinary achievements are made possible by dreaming big. I’m still inspiring and motivating people to get into this game because I have a vision. I just can’t be content basking in my past glories. Hence the birth of SDAT Medimix Chandra TT coaching centre. I’m still working on upgrading this TT academy to produce world class players.